Championships and we now build and tune equipment that continues to win races and championships. It is absolutely imperative that racers reduce the number of variables on their bike as they go from race track to race track. Each track will demand a combination of shock and fork springs and settings to best hold the bike at its ideal geometry as the cornering loads and centrifugal forces work to crush it to bottom. Each track will have different levels of grip based on pavement quality and can also ‘artificially’ load the chassis with positive and negative banking as well as elevation changes. With our input on springs needed at each particular venue, we can then set your sags so that the bike will hold its ideal rake, trail, wheelbase, swing arm angle, and ride heights to help you perform at your absolute best. In our shop we will lift your bike up and measure our ‘top up reference’, then let it sit down under its own weight while balanced straight up and down, we call this first difference the Static Sag. We then put you on your bike and measure our reference points again, this difference is called the 1G, ‘rider’ or Dynamic Sag. We will adjust your preload to hit the Dynamic sag’s that we know will work at your preferred race track and coach you on what to watch for and how to tune moving from this point forward. We will then set your rebound and compression damping front and rear and again, guide you on changes and tuning as you get faster. Each racer isn’t 5’8” tall, and they don’t all weigh 155 pounds, and even they did, that weight isn’t likely to be distributed identically on their bodies, so for you to think your sags are fine because you bought the bike off a guy similar to your size just doesn’t hold water. Let us set up your sags by booking an appointment and beginning your journey of really understanding your suspension. If you need Fork Springs or Shock Springs to hit your target sag, we will let you know and most likely have it in stock. Your bike will handle safer and absorb bumps better, keeping you in control when your bike is set up properly for you. Road Race bike sag and set up starts at $110 and is done by booking an appointment at our shop. During your base Sag and Set up appointment, if we have booked the time, we can change fork springs, shock springs, look at ride height optimization, discuss and set fork oil levels, and discuss the evils and causes of fork friction. Rider weight, height, ability or experience, and riding style dictate the range of spring rates needed. This rider-necessitated spring rate range is then tuned by the bike they are on and the track they are heading to. Our years of riding, racing, and tuning experience can help us help you to get your bike sorted to the absolute best of it’s potential. Having your forks work with as little friction as possible is incredibly important. Any misalignment in the forks will dramatically affect how well the forks perform their task of supporting the bike and absorbing bumps. If the triple clamps are slightly twisted from a fall or poor installation, the forks will just be sticky in the top of their travel, but dramatically resist further motion deeper in their travel. Sloppy installation of the front wheel can result in forks that are closer together or farther apart than ideal, resulting in unpredictable positioning of the forks not to mention accelerated bushing wear, scoring of the tubes, high particulate generation inside the forks, and an accelerated penchant for leaking. We can walk you through aligning your forks for dramatically improved suspension performance and a massive improvement in how repeatable your bike will hit turning points on the race track, which perhaps you were blaming on yourself. If smooth fork action is still elusive, we straighten fork tubes in house if we find they are bent, which happen far more often than you may realize. We can also check your upper and lower triple clamps for bending as well, which is not uncommon on a crashed race bike. Motorcycle forks both ingress contamination (dirt and brake dust) and generate it internally from metal tubes sliding on bushings that are side loaded constantly and worse while braking. Pouring out your fork oil by yourself overnight gets about ¼ of the contamination out of the bottom of the fork and none out of the cartridge where the particulate has wedged into the shim stack holding it open slightly, dramatically reducing the damping. We disassemble the cartridge, pistons, all shims, then the tubes themselves to examine and service the bushings, seals and wipers where brake dust, bug guts, and road grime gets embedded. We often change the wear parts and then lathe polish the fork tubes to remove traces of vertical scoring. This helps the seals run smooth and do their primary job of sealing, which can even dramatically reduce friction. Base price starts at $250 plus parts, (seals, bushings, wipers, o-rings, new copper base bolt washers) and lathe polishing if required. Revalve service and Respringing is available if improvements are desired. If you bring your bike to us, we charge $100 to remove the fender, calipers, axle, wheel, and then reinstall all with our surface plates to ensure perfect tube alignment when complete. We change the oil in our engine once or twice every season, but we somehow think the 0.3 litres trapped in our shock since our bike was new is invincible. Most riders don’t feel the 1% that the shock degrades every time we ride it as engine heat and constant bump motion break down the oil. Sediment drops down and accumulates around the shaft and seal inside the shock, making it sticky and reducing ride comfort. Most will only service the shock when it finally gives up, fails completely and dumps its oil out. You don’t wait till a connecting rod comes out of your engine cases before changing your engine oil, do you? Expect a dramatic improvement in comfort, bump compliance, and performance with just a service to freshen the synthetic oil and a chance to remove all the break in contamination. Please be aware that the very popular Ohlins TTX motorcycle shock absorbers have a 10 hour service interval, which can equate to 2 or 3 times a season depending on your number of races entered, practice days, and qualifying sessions. Most other race shocks, with hard anodized aluminum bodies and matching pistons, greatly benefit from a full service every season. Base price starts at $145 for aftermarket shocks and $160 for OEM shocks. Any seals, o-rings, nitrogen seals, lathe polishing, and other repairs that may be needed after inspection are added in addition to the base price. Revalve service and Respringing is available if improvements are desired. Often your expectations as a rider exceed the factory developed setting of your forks or shock. Perhaps you are very light, or they missed the mark and you find your ride far too harsh? Perhaps you ride faster with more aggressive inputs than the stock settings can handle? Or maybe you have adjusted your compression or rebound all the way to one extreme and it keeps getting better, then you find the adjuster at max or minimum? Agreeing with any of the previous statements are just a few of the reasons that you are a candidate for getting your suspension revalved. We will ask you pointed questions about your riding style and expectations and then ask you if you have exhausted the stock adjustments on your bike. What did you find as you made adjustments? If you have changed the springs on your bike to correct for the load you carry, the suspension will often need a revalve to control the new spring properly. Are your clickers all the way open or shut? Maybe your bike doesn’t have clickers? Maybe you would like some? If so, we can discuss replacement cartridges or replacing the shock. Revalving fee for a shock or pair of forks starts at $65, plus the cost of shims, and will be added to your fork or shock service if you need it. Shims range from $2.50 to $3.00 each. We may need two or three in a shock that is close, or 20-30 in a pair of forks if they are sadly out to lunch. We can guide you completely on your revalve needs and let you know what might be of benefit to you and your bike. Due to mileage, use, cleaning, and then exacerbated by the thermal cycling our Canadian bikes experience without use during winter storage, rust gets into the steering head bearings, linkage pivots, chain rollers, wheel bearings, lever and shifter pivots, the throttle tube mechanism etc. Making sure all these critical pivots are smooth and lubricated is what makes a brand-new bike feel… well, like brand-new. When we elevate your bike to remove the forks for Fork Service it is the perfect time to gently swing the handlebars from left to right to check for sticky or notchy steering head bearings, which mostly happen during winter storage when all the (often very limited grease from the factory) has been wiped away. We then try and gently pull and push on the axle to see if the bearings are just loose, as they naturally become over time. Any excessive play in the fork bushings can be confirmed at this time. After we have elevated the bike and removed the shock for Shock Service we can pivot the swingarm through its range of motion to see if the linkage bearings need grease or replacing. None of these bearings are very expensive (usually $15-$40 each) and with the suspension out, half of the labour has already been done. Bad bearings are often hard to feel but make the bike hunt in a straight line and ride poorly, reducing rider confidence without knowing why, reduce bump compliance for sure and if left longer, full seizing can result with dramatic effects on safety. Prices vary, labour rates are $110 an hour. Steering head bearing service is usually 1.5 hours depending on the maintenance the bike has seen. Linkage bearings can take 1 hour to more than 4 hours if they have been ignored for years. 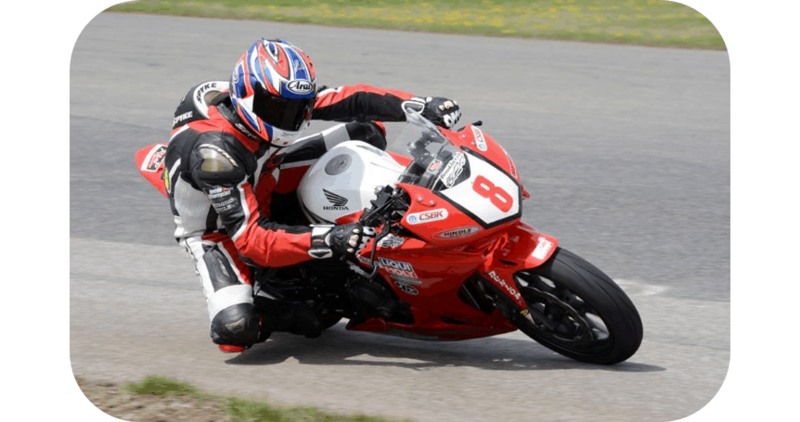 Accelerated Technologies in Buckhorn didn’t win 4 consecutive CSBK Pro National #1 plates without knowing how to improve the performance of a Road race bike! We can discuss your wishes and expectations with you, decide on a budget, and then recommend how best to meet your goals in a timely fashion. From engine mods, exhaust changes and fuel injection improvements to tires, gearing changes, weight reduction and dyno tuning, we can facilitate most dreams you have for your bike to make huge improvements. An extensive range of suppliers ship parts to us daily to help us maintain and improve hundreds of bikes a year. Labour rate is $110 an hour for most Performance Projects. We wish none of our customers ever fell down, but bikes have only two wheels and both physics and gravity are proven forces. After a handlebar has touched the ground the damage can be as little as the forks being out of alignment, gently twisted in the triple clamps, to more serious bending and fractures. When evaluating a front-end impact for example, we measure the wheels and brake rotors for lateral and radial run out (bending), we examine the steering stops for impact level, we measure the inner and outer fork tubes for straight, we then feel and examine steering head bearings and handlebars until we find where the energy of the impact has stopped. We can straighten most bent motorcycle fork tubes if not creased from a bad impact, and true some bent wheels as well. We have perfected bent rotors in house and trued spoked rims after even the slightest deflection damage from a (suspected) overzealous tire machine. Our goal is rolling the bike out of our facility better than before your crash. Accidents happen - we can make it better! Labour rates are $110 an hour. Fork tube straightening is $100 per a tube. Get the setup you and your motorcycle deserve.